A small village, once called Skirdustan and still called “Obar Lobhair” in Gaelic, and named after a noisy burn flowing into the river Spey, is the unsung centre of traditional Scottish cuisine. Moray is one of the most more-ish places on earth. Scotland’s contributions to gourmet food does not end with Teviot salmon, Loch Fyne kippers, Angus beef, venison and haggis. Moray County and its luxury leftovers have perhaps done more to put Scotland on the gastro map of the world than any other melt-in-the-mouth snack. The malt whisky town of Charleston of Aberlour, 19 kilometres from Elgin in north-east Scotland, is the place to go to sample creamery butter, flour, salt and sugar at source and taste fresh from the oven a delicacy inspired by female underwear. Walkers Shortbread is Scotland’s biggest exporter of food. This year, it celebrates its 120th anniversary. 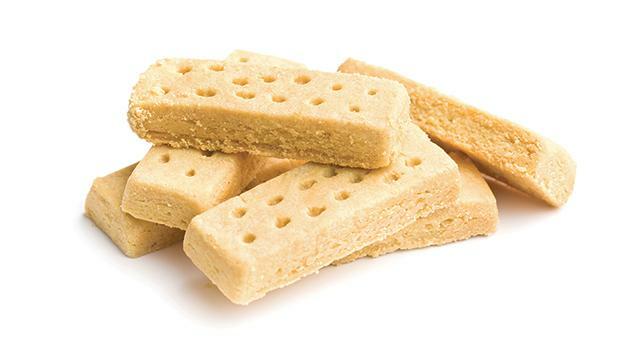 £50 million worth of shortbread are exported from Scotland worldwide every year. The company also makes slab cakes and Ecclefechan butter tarts. In the US, the company’s offices are in Hauppauge, New York. In 1898, Joseph Walker started the business with a £50 bank loan. He delivered by horse and cart. The first van came in the 1930s. One shop became a business empire. Walker died in 1954 but it is still a family business, producing “The World’s Finest Shortbread” by royal appointment, and every new product is test-trialled for a seal of approval in Aberlour’s village shop. Scotland also boasts Stag Bakeries at Stornoway on the Hebridean island of Lewis. It produces seaweed shortbread as well as walnut oaties and water biscuits. The fourth generation Maclean Highland Bakery in Forres make berry, honey and butterscotch shortbread. Forres is probably the birthplace of the ‘digestive biscuit’. The sweet brown meal biscuit was created by two Scottish doctors in Logie Steading. John Montgomerie of Scotland was granted a US patent application in 1890. He claimed his “saccharification process” made “nourishing food for people of weak digestion”. Mackenzie Biscuits in Turriff, Aberdeenshire, goes back to 1952. Its product range includes cornflake and stem ginger ‘crunch cookies’, savoury celery ‘oval Alberts’ and traditional butter biscuits and Scottish ‘oaties’. Says Gerry Mackenzie: “Oatcakes have been part of the Scottish diet since Roman times. Maybe long before. Scottish soldiers would carry a sack of oatmeal and a girdle (griddle) to cook them on over an open fire. Samuel Johnson famously defined oats in his 1755 dictionary as “a grain, which in England is generally given to horses, but in Scotland supports the people”. Shortbread has a long history. It is one of the oldest biscuits. The ‘Garibaldi’ biscuit (sometimes called “fly pie” as it consists of currants squashed between fermented dough) was invented in 1861. The similar ‘Eccles cake’ was being sold in the streets of Greater Manchester a century earlier. The cream cracker was the idea of Dubliner Joseph Haughton in 1885. Around about the same time came the Bakewall tart and tarte tatin. Custard creams first appeared in 1908. The bourbon (originally ‘Creola’) was the 1910 brainchild of biscuitier Patrick Turner of London’s Peek Frears, based in Bermondsey’s “Biscuit Town”. Pavlova was invented in the 1920s. Jaffa cakes first went on sale in 1927. Twiglets date from 1929 and Penguins were introduced in 1932. Ruth Wakefield invented chocolate chip cookies in 1938. HobNobs were only introduced in 1986. Many old British biscuit-making firms have now been swallowed up by conglomerates. Crawford’s, makers of custard crèmes with their signature Victorian baroque fern design, closed in 1996. McVitie’s, founded by Robert McVitie in 1830, is now part of United Biscuits. Yorkshire claims to be the birthplace of Rich Tea biscuits. Joseph Huntley (of Reading, England’s Huntley and Palmer) started selling home-baked snacks to stagecoach passengers in 1822. Coconut Nice biscuits with their sand-serif capital lettering came out in 1904. Fox’s Biscuits began in a terrace house in Batley, west Yorkshire in 1853. Tunnock’s have been making tea cakes and chocolate wafers in Uddingston, near Glasgow since 1890. Scotland has a legitimate claim to be the ancestral home of the mid-morning or afternoon tea biscuit. The Scots may have also invented ‘dunking’. 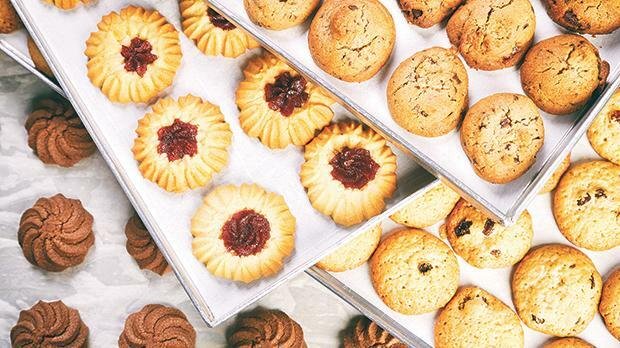 Germany may have its wibele, the Netherlands its jodenkoek, Italy its ricciarelli, France its petit beurre and macaron (croissants were known until 1853) , Spain its panallets and Iraq its kleicha but there is only one Scottish shortbread. And it was originally a waste product. Biscuit means ‘twice cooked’. In medieval times left over dough was hardened into a rusk. Then sugared or spiced. Yeast was replaced by butter and biscuit bread evolved into shortbread. In the 16th century Mary Queen of Scots reportedly had a taste for “Petticoat Tails” flavoured with caraway seeds. The tail may be a corruption of the French petites gatelles (little cakes) but they also resembled pieces of wedge-like fabric used in making ladies’ under garments. A tally was a pattern. It is a coincidence that shortbread has a connection with shorts. Shortbread is bread that has been shortened. Had butter added which stops gluten strands forming. In baking, ‘short’ is an old-term meaning crumbly. The traditional ingredient ratio in shortbread is one part sugar, two parts butter and three parts flour. Today the flour is generally all-purpose wheat flour, but it was made from oats. Rice flour gives shortbread its grainy texture. Scottish bakers once classified shortbread as bread to avoid paying biscuit tax. The first printed recipe is thought to have appeared as early as 1736. Citrus peel and almond nuts were recommended ingredients. Shortbread slowly evolved into “a specialty item of flour confectionery”. The dough is often pressed into circular moulds with intricate designs, to make it recall the Yule bannock, an ancient, rounded cake said to resemble the sun. And used in pagan rites. Breaking shortbread over a bride’s head is another tradition still observed in some parts of Scotland today. That fact and that there is now an annual Biscuit World Cup and January 6 is the official National US Shortbread Day and the claim that 50 biscuits are consumed every second around the world every day Joseph Walker would find very hard to digest.